Tony Blair has spoken to President Bush and US Secretary of State Condoleezza Rice about becoming a Middle East envoy, a White House official says. Two senior US administration sources told the BBC that the PM's aides have indicated he is interested in the role. The president would reportedly like him to be an envoy for the quartet of the US, European Union, UN and Russia. The PM's official spokesman said there was lots of speculation over Mr Blair's future, much of it "inaccurate". The White House officials told the BBC that the talks were preliminary, and did not have any comment on Mr Blair's reaction to the suggestion. But later, the administration sources told the BBC's Jonathan Beale that both Israel and the Palestinians had signed up to the proposal. Beale said: "Most important of all Tony Blair, or aides of Mr Blair, have signed up to this. "It looks like this is going to be Tony Blair's next job and it looks like Tony Blair wants this job... that is the message I am getting from officials in Washington." However, he added that the appointment was not a "foregone conclusion" and that more discussions were needed. 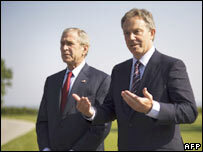 Beale said that Mr Blair would not be President Bush's envoy under the plan but specifically the envoy of the quartet of nations and institutions mediating in the Middle East. But he added that there was momentum building for Mr Blair to take the role with backing from the US. Mr Blair steps down as prime minister on 27 June, ending 10 years in Downing Street. The White House officials did not know if the president had discussed the idea with the other three members of the peace quartet. It follows reports on the al-Jazeera TV news network that Mr Blair was set to take up the position, which has been vacant since former World Bank chief James Wolfensohn resigned the post in April 2006. Israeli government spokeswoman Miri Eisin said: "Officials in the prime minister's office are aware of this idea and Prime Minister (Ehud) Olmert is very supportive of Prime Minister Blair and of his continuing involvement in the Middle East and the peace process." White House spokeswoman Dana Perino said: "Obviously Prime Minister Blair has been very active and deeply involved in Middle East peace issues throughout his prime ministership." She added that Mr Blair and the US President spoke often, adding: "It would not surprise me if they have talked about what Prime Minister Blair would like to do following the end of his term... but we don't have anything to announce today". Mr Blair is a controversial figure in some Arab circles, after his refusal to press for an immediate ceasefire during the war in Lebanon in 2006 and his prominent backing for the US-led invasion of Iraq in 2003.